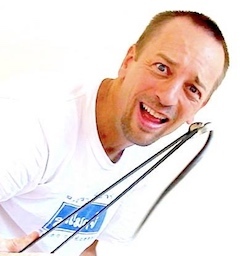 Johnny, shows the audience that the fangs and venom glands ARE still in all snakes at the show… click to enlarge, as he milks a monocled cobra. 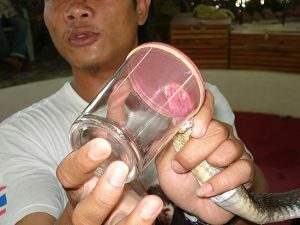 Closer to Noppharat Thara Beach than Ao Nang is a King Cobra Show for tourists and locals. They typically have some King Cobras, monocled cobras (Naja kaouthia), Burmese Python, Mangrove Cat Snakes, Red Tailed Racers, some Radiated Rat Snakes and Malayan Pit Vipers. 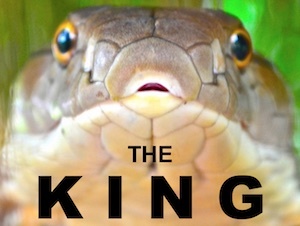 I’ve been to three King Cobra Shows in Thailand and this one hundreds of times. 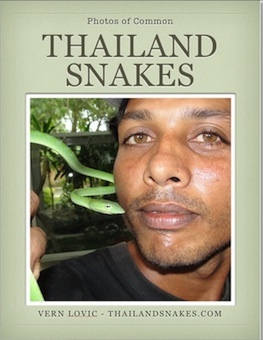 The show employs young Burmese guys who never really wanted to be in the show working with venomous snakes, but they felt like they had no choice to make money for their families. All cobras have their teeth, venom glands, and are fully capable of killing the presenters. If you doubt that, have a look at Dom’s right thigh – where he is still healing up from a recent cobra bite. The show is open from 9 am through 5 pm daily.